It becomes apparent not too far into the The Butler that the film's main problem is one of story - or to be more precise, two competing stories. On the one hand, director Lee Daniels wants to make a dramatic and highly personal narrative of the life story of Cecil Gaines (Forest Whitaker). Cecil’s is the more successful of the brace of tales Daniels attempts, although it is not without its inconsistencies. The director rushes us through much of Cecil’s early life, hastily making the journey from a young boy on a cotton plantation to a young man serving in a prestigious Washington DC hotel, along with a wife and two sons at home, within the first fifteen minutes of screen time. Once there, Daniels thankfully prises his foot off the accelerator and allows his able cast, led by a dependably strong Whitaker, to build the film up. It’s once Cecil reaches his employment at The White House that the film’s second story unfortunately begins to interfere. Daniels essentially gives us his cinematic take on American history throughout much of the 20th Century, with particular focus on the country’s treatment of the black population. Regrettably, the director regularly fails to make this strand of The Butler feel like anything more than a history textbook played out on screen. The bared and powerful teeth Daniels showed in Precious are too often absent, instead presenting events here in a largely straightforward fashion. 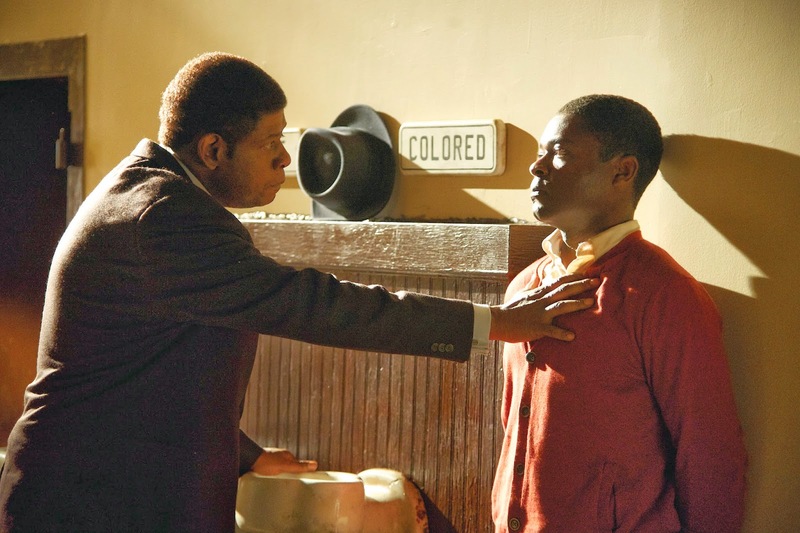 At times this is all the director needs to do: a sequence showing a group of black students, including Cecil’s son Louis (David Oyelowo), staging a sit-in protest in the “whites only” section of a diner and the subsequent abuse they suffer speaks loud and clear on its own. But at others, the director’s voice feels notably absent, rendering the historical recreations a little too mechanical to truly engage. Daniels also achieves mixed success with his choice to cast several big names as some of the century’s US Presidents. Robin Williams kicks things off as Dwight D. Eisenhower, but makes almost no impression at all after being afforded literally a few minutes on screen. James Marsden as JFK fares a little better, doing the best he can with the handful of scenes he has. Liev Schreiber is the most unimpressive, landing somewhere between an unconvincing impersonation and a weak parody of Lyndon B. Johnson. Alan Rickman as Ronald Reagan arguably looks the most like the president he’s playing, as well as adopting some Reaganisms without turning his performance into satirical farce, but again is given very little chance to make an impact. It’s John Cusack who emerges the most convincing of the presidents as Richard Nixon, even more impressive when you consider that all he has to make himself look even remotely like Nixon is a prosthetic nose. Cusack succeeds partly by successfully channelling the weaselling nature of the notorious politician whilst avoiding any caricature, but also because he’s the only presidential actor here who’s actually given bona fide opportunity to develop his character, appearing early on as Eisenhower’s vice president before reappearing later during Nixon’s own administration. Cusack’s turn aside, whilst it’s entertaining every so often to see a well-known face playing another quite different well-known face, Daniels’ star-studded Oval Office never manages to escape feeling like largely unnecessary stunt casting. It’s this lack of balance which ultimately holds The Butler back from ever being more than just a good film. The collective cast are consistently solid, with the likes of Cuba Gooding Jr., Lenny Kravitz and Terrence Howard putting in enjoyable supporting turns as friends and colleagues of Cecil. But all three of their characters are eventually allowed to unceremoniously disappear from the story without a satisfying conclusion to the roles they have played. It’s hard not to think this wouldn’t be the case had Daniels not been so determined to make an all-star history of 20th Century America alongside his intimate story of Cecil’s life. The Butler could undoubtedly have turned out as a more fulfilling experience than it is had the historical events instead been allowed to form a backdrop to Cecil’s personal and family affairs. As it is, Daniels tries to fit too much into his film, making the whole thing feel too lacking in depth to ever resonate as much as you want it to.